Running Skirts have been my hearts desire since I began running. They are so darn cute and ladylike. This past year I told myself, when I lose 20 I will get a set. Well, the 20 is still on me and yesterday I bought a set to try out. Reebok Playdry Pleated Skirt. Adorable. TJ Maxx had it on sale for $16.99 and in an XL. This morning I tried it out during my 3 mile easy jog. Here's where it started to cause some friction...literally. The shorts under the skirt are not compression shorts. When 2 thighs that touch start a 4 mph jog the shorts ride up above the areas that touch. OUCH! The skirt itself pretty much stayed in place, thus hiding the turning-red-by-each-stride inside thighs! Saturday I will wear this skirt for the Soldier Field 10 Mile, over compression running capris and see if the added layer helps with the short ride-up. Then maybe I'll do some cross-training to focus on these all-my-life troublesome areas to avoid this problem once and for all! 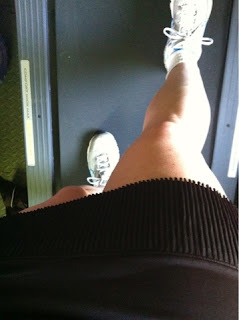 What brand running skirt do you wear? Pros, cons? How are they with inner thigh friction?